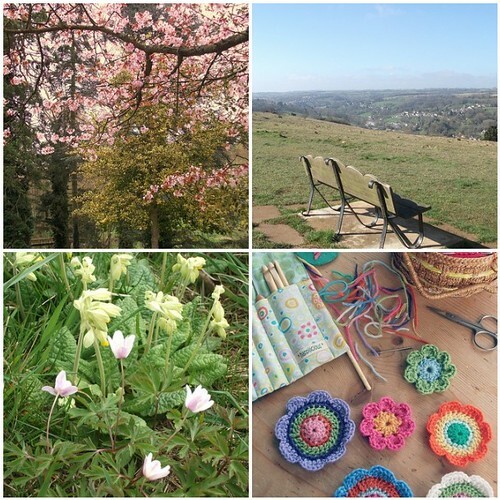 Isn't it wonderful how just putting together a post can be enough to help us see the cheerful things around us? There's something about the process of blogging that enhances life and makes me notice more the good things. And it lifts you up. It becomes a little bit part of who you are. And we need that don't we? The whole sequence of photographing, editing, and loading photos to flickr, where I can see them altogether, on display, in a colourful group, is very satisfying in it's self. Things change and evolve as I learn more. I like the cheerful reminders pictures bring us. 1. Sunlight dancing through beautiful soft, pink blossom in the park. Makes my heart soar after this long cold winter. 2. Blue skies, the promise of a gorgeous sunny day on the top of the common. 3. The wild flowers growing here in April. 4. At home experimenting with pattern and colour, I'm really enjoying my hobby! 5. 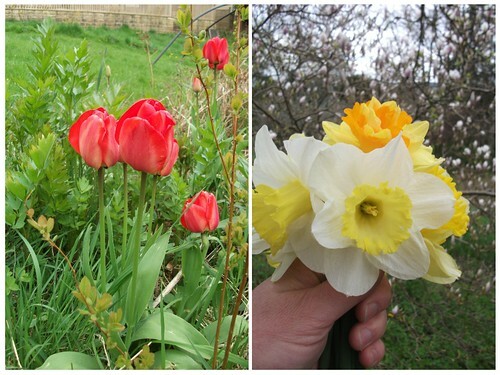 Wandering around my garden now it's spring. The red tulips are divine, such a gorgeous colour, and the Daffs, well, they're just magic. So many pretty kinds have been planted here. 6. Little glimpses of cabin life as I wander by. Looks like someone has an admirer! 7. 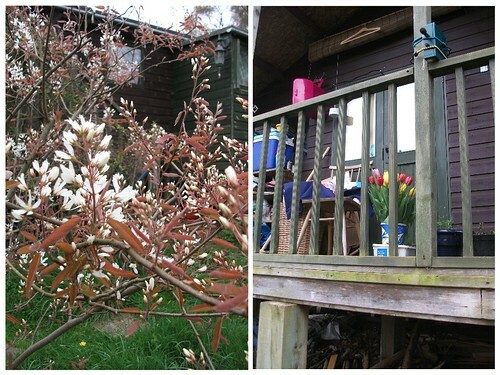 A beautiful and unusual Japanese style blossom tree outside the cabin, so pretty. 9. Another cushion on it's way. I'm always ridiculously thrilled to send a cushion from my etsy shop on it's travels! 10. My new thrifted, blue suitcase. In mint condition for three pounds! Just look at the inside! and it's now become a great storage place for my shop items. 11. Birthday flowers for me. Aren't they heavenly! Simple is best right. 12. Another year older and wiser. Thank goodness for pic monkey editing.....! I like dusk! This week looks like it will be a challenging week for us. Several quite important things need thinking about and new decisions will maybe need making in the not to distant future. I'm just trying to keep steady here. Really there are so many good things. When the time is right I think we will be able to embrace them more so, and enter into the spirit of things with more gusto. For now it's just a time of holding this space and moving slowly through the challenges. But life is good and there are so many reasons to be cheerful. 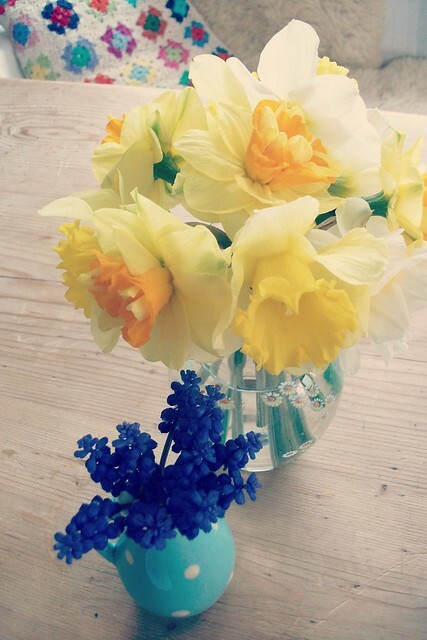 Your pictures are so lovely and I am truly delighted to see that you are happy and enjoying spring! 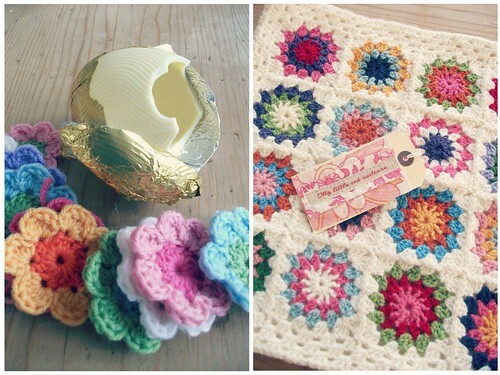 Your sense of colour, apparent in your crochet work, is delightful. Best wishes for the new week. ps I'm so sorry! I forgot to wish you a very happy belated birthday! & Good luck with all the challenges ahead. PS Your suitcase is a beauty! Happy growing wiser day dear Heather :) The lovely clicks made me smile, especially the orange crochet flowers with the green center, very clever! 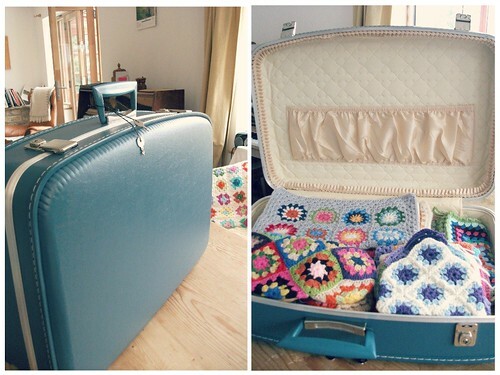 Your new suitcase is amazing and your crochet flowers are just lovely! New good challenges? deep breath and jump!!!!!! Hi There, Happy B Day!!! And what a lovely post!!! Love all the things that has made you sooooo happy this week, clearly a good place to start a difficult week from!!!! What a great post to be cheerful. I loved your all reasons.. I really liked what you said about blogging - it does enhance the good things and posts like these are a delight to read. Your cushion is totaly gorgeous, by the way. Hello again Heather and Happy Birthday! I had to ignore the warnings and jump right in to enjoy yet another lovely uplifting post - thank you for it, and I wish you many blessings and strength to overcome all obstacles! Happy belated birthday from me and Annie! So many colourful things ... they really do look cheerful.